Seneca III sends the latest on all the Brexit brouhaha. Exclusive: paper says ‘critical phase’ could last months as fears rise over disruption to transport and food supplies. The classified document, seen by the Guardian, sets out the command and control structures in Whitehall for coping with a no-deal departure and says government departments will have to firefight most problems for themselves — or risk a collapse of “Operation Yellowhammer”. Leaked to the Guardian? Of course, but by whom? And, most importantly, why? Whatever. This CONOP looks like it’s laying the groundwork for bringing many if not all of the provisions of Blair’s iniquitous 2004 ‘Civil Contingencies Act’ into effect in all but name. Bear in mind that the Civil Contingencies Directorate was quietly activated some months ago and is probably in the background playing a major part in the Yellowhammer planning and later execution processes. The committee will be available to take an overview of the situation and make any relevant decisions including on the following areas but not limited to legislation, identifying funding opportunities, allocation of national level resources such as military, law enforcement or civil service resources, direction of government bodies and relaxation of regulations required at the ministerial level. It has long been understood that one ploy used by governments desperate to cover up their own inadequacies and failures is to create a crisis then award themselves special powers to deal with it and afterwards clap themselves on the back, saying, “Look how well we did there,” whilst continuing to hold onto the special powers they had granted themselves. By such means do free nations slide inexorably into totalitarianism. With a Muslim Home Secretary who has his eyes firmly set on 10 Downing Street and a current PM whose days are numbered, this should be a cause for deep concern amongst all free men and women. In another related plot-within-plots, BBC Radio ‘News’ at 1200 hours today (23/3/19) opened with a long piece on the anti-democratic “gizus another referendum” mob marching in Londonistan led by all the usual suspects and supported and approved by Khan, of course. The prime guest talking head on the supposed ‘news flash’ was the loathsome Soubry peddling her usual treacherous drivel. Keep it up, Al Beeb, we’re all watching, and we know what you’re about. Our day will come. Meanwhile in Italy, an ‘Italian of Senegalese origin’, Ousseynou Sy, yesterday attempted to immolate 51 children on a school bus he was driving. The MSM and the authorities are in the process of labelling this as ‘mental instability’ whilst ignoring the fact that Senegal is 96.1% Muslim, 3% Catholic and just under 1% Animist. One alternative point of view, however, is that the single most significant sign of mental instability is an ability to quote long sections of the Quran — which he did — as justification for murderous behavior and various other atrocities, but unless we have the guts to label them all mentally unstable that’s pretty much an oxymoron. Or ‘Nothing to do with Islam’ as David Cameron would say. — Seneca III, in Middle England and well clear of the festering metropolitan bubble this 23rd day of March 2019. This entry was posted in Civil Liberties, Counterjihad, Enrichment, Europe, Insanity, Legal action, News, Politics, Stupidity, Treason, UK by Baron Bodissey. Bookmark the permalink. Great piece, interesting times ahead. 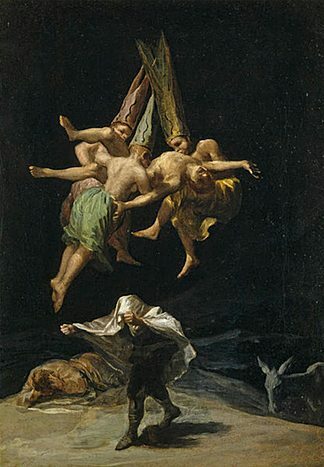 If you put your mouse pointer on the painting, you’ll see the title: “Witches’ Flight” by Francisco de Goya, 1798. What does “gizus” mean? Some kind of British dialect? An online search avails not, and “gizus” could hardly be short for “give us”. It’s a variation on the phrase ‘Gis us a job’, which entered English consciousness, via a popular English TV programme, “The Boys from the Blackstuff”. I think it is some sort of variant from “gives us/gets us” >> “givesus” >> “givzus” >> “gizus” ? Like “dindo nothin” is from “I did not do nothing”. I wonder if this might come to pass, for saving England a bit longer? Mark, I took “gizuz” as a Jesus sparing kinder, more censored, way of stating growing tired of seeming countless “referendums” as their delaying excuses hoping for some kind of wherrying the votary down. Gizus is slang for give us. “Gizuz “is indeed street talk for give us … as in “gizuz your wallet”. The coup is to replace one remainiac loser with a panel of treasonous remainiac losers lead by a creature called Gove. A snake in human form. I belong to the school of thought that considers there is not, and never was, a coup plot. Instead I suggest that it is another attempt to bounce those incarcerated at Chequers into supporting May’s “Made in Berlin” “deal”. They will not be released until they have signed the ready prepared spontaneous self confession. Stalin would have been so proud. Chamberlain would have been even prouder. I have lost all my respect for UK, to some extent for the Britons as well – as the Brexit farce is unfolding, free speech suppressed as never before and pandering to the Cult at its all-time high. But no respect at all. Sorry. Lu, I’m guessing you’re Czech? I’m not responsible for the way the British government treated your country in 1938, or the even more inexplicable concession Churchill made to Stalin in 1945, when Czechs and Poles who’d fought alongside us were not allowed to participate in the victory parade in London, but I am truly sorry. It probably doesn’t help, but when I visited Prague in 2013, I sat by the Charles Bridge and listened to Smetana’s “Vltava” (Kubelik/Czech Philharmonic, live, Prague Spring 1990) and shed a few tears. Churchill’s concessions to Stalin (Russia’s concupiscence towards all of Eastern Europe was well-known) had a lot to do with the pressure applied by FDR. America propped up Russia whilst making Britain pay through the nose for every piece of materiel. Those loans made to Britain by our government weren’t paid in full for many decades after the war. The turn toward socialism in the UK didn’t help, but the US thumb on the scale was most unfair. I am Czech by birth and American by choice. I hear you, Mark. Please do not apologize for what you did not cause … but I appreciate your sincerity! The tears now should be shed for Albion, your homeland. It is now the country I have always admired – USA – to be the (last ?) bastion of freedom. I voted to leave, but assumed (wrongly) that the governent would negotiate a similar trade deal to Norway’s or Switzerland’s. The current proposals satisfy almost no-one. Alan Bleasdale, author of “Boys from the Black Stuff”, also wrote a brilliant tv satire (“GBH”*, 1981) about a corrupt, hard left mayor of a northern English city (which he denies was based on Derek Hatton in Liverpool); the timid schoolteacher who stands up to him was played by Michael Palin of “Monty Python” fame. *Police acronym for “Grievous Bodily Harm”, a particularly serious assault.